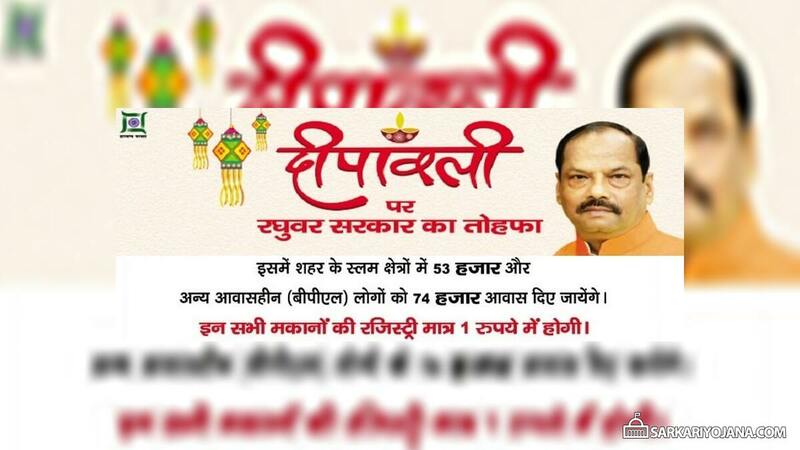 Jharkhand CM Raghubar Das has announced to start a new housing project to construct 1.27 lakh houses at affordable rates (G+3 category) under Pradhan Mantri Awas Yojana for slum dwellers. Under this PMAY housing project, the state govt. will provide 53,000 houses in urban slum areas and 74,000 houses for homeless (BPL) people. The registry of houses is proposed to be done at a cost of just Rs. 1. PMAY housing scheme in Jharkhand will ensure that each homeless person belonging to poor and economically weaker sections who is living in slum areas has their own pucca ghar. This is a Diwali gift to the people belonging to the poor community under the state govt. housing scheme. Only those people who does not possess any house in their name across the country would remain eligible. Jharkhand govt. is consistently working to provide affordable houses to poor people and to realize the vision of Housing for All. So, govt. has decided to start a new housing project in which 53,000 houses in slums of urban areas and 74,000 houses for BPL people would be constructed. The decision to construct 1.27 lakh houses for poor people belonging to economically weaker sections comes in the wake of upcoming Diwali festival. As per the initial estimates, the total cost to construct 1 unit of house is around Rs. 7.5 lakh. To meet these expenses, central govt. will provide Rs. 1 lakh while another Rs. 1 lakh would be pooled in by the state government. Even the builder will also contribute a share of 55% which will reduce the total cost of 1 unit by about Rs. 4 lakh. So, the beneficiary will be liable to pay only the remaining Rs. 1.5 lakh for a single unit. Similarly, the state government is also going to provide houses to all those people who does not own a house in their name in any part of the country. All the prospective seekers (homebuyers) will have have to produce a certificate issued by the revenue workers of their native state. All the applicant people must compulsorily possess voter card and bank account. As per the statement, the total cost of these houses is around Rs. 7 to 8 lakh. Out of this total amount, beneficiary must shell out Rs. 5 to 6 lakh and the remaining amount would be paid jointly by the central and state government. All the beneficiaries would also be able to take loans at lower interest rates from banks. All the houses would have a lock-in period of 15 years. At the end of this period, the owners would be able to sell their house.